Located near the harbour and Sentosa Island, Singapore’s biggest mall VivoCity is easy to reach and offers a wide variety of stores and entertainment, with a focus on modern fashion and architecture. While there are many luxury purchases to be made, the mall also has more basic and everyday products available. In addition to countless clothing stores, there are also many bookstores, food courts, boutiques, and pharmacies, as well as a sky park and playground to keep the kids entertained. The Paragon mall is the place to go for those who seek luxurious and fashionable goods. The proud winner of various consumer awards, the centrally located Paragon centre is home to both casual and fine dining, modern and traditional medical specialists, high-end designer clothing stores for young and old, and live entertainment on an almost daily basis. Leaning towards a more classic style and image, Ngee Ann City is particularly famous for its Takashiyama department store. It is in part because of this that the mall has a clear presence of Japanese brands. On top of this, there are also many Asian-style restaurants present within Ngee Ann City. However, large international brands are definitely also represented, especially in fashion and accessory speciality stores. The mall often plays host to large live events such as fashion shows and concerts. With its sleek appearance, the Mandarin Gallery is a real eye-catcher. 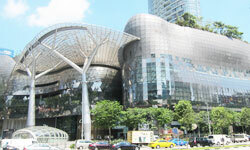 While relatively small compared to Singapore’s other malls, the elegant Gallery contains a comprehensive collection of international stores and boutiques. The mall is known for catering to the tastes of those who look for sophistication and grace, and the dining options fit in with this mindset, with restaurants offering fine dining from all over the world. While some of Singapore’s shopping centres focus on catering to a more elite clientele, the ION Orchard mall definitely strives to meet everyone’s needs. Housed in a futuristic-looking building (and partially underground), the mall contains a range of contemporary fashion brands, and even less high-end stores are known for their quality and style. The food court in the basement is famed as the largest in Singapore, and the Orchard’s art gallery is worth the trip.